Nowadays, fabric steamers are becoming staples in the average home… but that doesn’t mean everyone already has one. If you’re yet in the process of seeking out the right fabric steamer for you, let this be your guide. We’ll show you what you should be looking for as well as what products, in particular, get the most kudos from other buyers. Let’s begin first by saying that the steamers we are discussing here are the ones designed for home use. Portable steamers have their virtues, but they also have limited water capacities. This means less steam time for each fill and—usually, anyway—less power. The best home steamers thus have great heating power. But this comes at a cost: the majority of the ones that do offer said power also have very high wattage. Higher power consumption means higher power bills, so keep that in mind before grabbing the first high-wattage one you discover. You also want a steamer that heats quickly and produces a steady supply of steam. Good steamers will have a minimum of water spills and wet clothes associated with them. Check the water capacity and steam time per fill of each steamer too: you want something that can hold enough water for at least 1 hour of steaming per fill. After owning a steamer myself and reading as much user feedback as possible, I’ve come to the following conclusion: Jiffy Steamers are the most likely to make you happy without hurting your wallet too much. 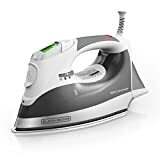 The Black & Decker D2030 Auto-off Digital Advantage Iron may bear a faint resemblance to the old irons, but it is a fabric steamer with all the latest features. This bargain steamer delivers quality (and looks) most wouldn’t expect for its cost. PROS: The Black & Decker D2030 Auto-off Digital Advantage Iron has nicely high wattage, ensuring good steam output and steady heating. Automation, as well as precise user control, is aided by the digital display, which allows the user to set the temperature and select the appropriate mode for the task. Vertical steaming is offered as a distinct mode, and the machine offers preset that work best for specific fabric types. The sole plate is crafted out of durable and smooth stainless steel. CONS: The recurring complaint about the D2030 has to do with a particular part of its design: the cover for the water well. The cover has been described as slightly flimsy, with some owners reporting that theirs broke easily. It comes with a feature that shuts it down based on motion detection. CONCLUSION: The Black & Decker D2030 Auto-off Digital Advantage Iron is a great fabric steamer for the price. Versatile, fairly well-built, and modern enough to please the most automation-addicted, this sweet little steamer should be a good addition to most households’ appliances. The Rowenta IS6200 Compact Valet Full Size Garment steamer is much bigger the Black & Decker D2030 and is an alternative for those who prefer wand-style streamers. PROS: The IS6200 supplies steam very quickly from the moment it is turned on. The foot-pedal operation allows the user more efficient use of his hands while steaming. It can be assembled easily and has been praised for the simplicity of its bundled instructions. Its compactness when the shaft is retracted also makes it easy to store. The large water container means users can refill less even on big jobs. CONS: The clips on the incorporated hanger have been described as flimsy and difficult. Some also find the cord still on the short side. This steamer also draws on a fair amount of power. It comes with a lint tool, an attachment for fabric, and a creasing attachment. CONCLUSION: The Rowenta IS6200 Compact Valet Full Size Garment steamer is a powerful steamer with some nice features, like the tap-water-compatible and large water reservoir, foot pedals, and bundled attachments. It’s a good competitor for the Black & Decker when it comes to residential-use fabric steamers. Pro tip: Try steaming from the inside of your garment. For example, if steaming a shirt put the steam head inside the shirt and use your other hand to stretch the fabric lightly. You do not need a lot of force, just enough to keep it taught. Most users do not know this important tip! That’s right: the last item on this list is a press-style steamer. The SteamFast has the lowest wattage on this list, but that doesn’t make it less hot as a product. PROS: The large heated and pressing surface results in less time spent on each garment or cloth for users. It heats up very quickly and has been reported to have good max temperatures as well as neat pressing. The heft of the product also renders it less likely to budge during use or topple. CONS: Some users did not like the automatic shut-off on the device. Complaints were also voiced regarding the force with which the lid (the upper plate) goes up: it tends to jerk the entire steamer backward, which may be problematic if you do not ensure it is on a solid surface or have something else weighing down its stand. It is a 120V, 1350-watt device. CONCLUSION: The SF680 is a different beast from the Black & Decker and Rowenta on this list, but it manages to stand out all the better for it. 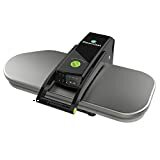 Good looks, an instant ironing board combining classic press and modern steam functions, and sturdy construction make it something most consumers should consider. The Jiffy J-2000 is your best bet as a residential user. Remember how I said that you could tell a lot about a unit by the user feedback? If you read all of the negative feedback on Amazon, this unit’s feedback revolves around whether or not it removes wrinkles. I can tell that the people posting negative comments do not understand how to use a steamer properly. The number of positive comments overwhelms any negatives. When looking at the J-2000, I suggest you get the regular version with the plastic head. The metal head is heavier and will get very hot. This increases your risk of being burned. The Jiffy J-4000 is your best bet as a commercial user. When I say “commercial” I mean anyone who is in the business of laundry. If you are a stay at home Mom, this is not you. If you are a housekeeper full time, then this is probably you. The Jiffy J-4000 has higher capacity, more options available, but will take 15 minutes to heat up. This heating time difference is the only reason I won’t recommend it to a residential user. If you are looking for a “magic wand” that you wave over your clothes to make them pristine and perfect, you are not going to find one. Trust me on this. But if you are looking for a great way to speed up wrinkle removal on most items – clothes steamers are fantastic. In my experience, they are about as close as you can get to having a magic want. Mind you a very hot magic wand! There are only two things you need to do to get the best possible results form your steamer. First, hang or tumble dry your clothes so that you aren’t dealing with massive creases. Just like using an iron, a heavily creased item will take longer to de-wrinkle. Second, make sure that you apply some tension to the fabric when steaming. This means keeping the fabric taught. This makes it at least 3-4x more effective – I’m dead serious here. The negative feedback you will read from some owners of steamers relates directly to their lack of understanding here. Please trust me when I tell you that price should not be your primary focus. If you buy a cheap model, you are likely to be disappointed. Spend at least $100 and get a good model. You get what you pay for. Heating power: You want to make sure you’re getting 1300 to 1500 watts of power. Less power means less steam. Steam is your weapon against wrinkles, and you need lots of it. Heating time: If you are a residential user doing only a few garments at a time, you’ll want your clothes steamer to heat up fast, as in 1-2 minutes. If you are using it for large jobs, you’ll get a professional unit that may take 15 minutes to heat up. Quality of stand: Most steamers come with a telescopic pole with a hanger attached to the top. You’ll place your garment on the hanger and steam it. Since you need to apply some tension to the fabric, you want to be sure the telescopic pole isn’t going to collapse (shorten) under this tension. Cheaper units suffer from this problem while better quality units are built with better quality parts. Length of hose and telescopic pole: Good quality clothes steamers come with a pole and a hose that are long enough to handle pants, dresses, and other garments. If you’re only using your steamer on shirts, this won’t bother you. But believe me – you will eventually want to use the steamer on other garments. Will my Clothes Steamer Replace my Iron? Almost. Within your few times using a clothes steamer, you will get the hang of applying some tension to the fabric while waving the steam head over your clothes. On all flat areas of fabric, this will work wonderfully. Around tight spots, such as collars on men’s shirts, you may need to pull out the trusty old iron. Does a Clothes Steamer Work on Heavy Fabric? It depends. If you take my advice and make sure that you don’t let the fabric dry with big creases, then it will be just fine. I’ve used my steamer on thick denim jeans, and it works perfectly. But if I ever leave a pair of jeans crumpled in a pile at the foot of my bed for days, I’ll need the iron. On thin material like cotton T-shirts, the wrinkles will melt away before your eyes. Same thing with silk. Do you Need to use Distilled Water with Your Clothes Steamer? You should. You can usually buy it for $1-2 for a couple of gallons in a corner store. But if you don’t use distilled water it isn’t the end of the world. There is a chance that you’ll get some mineral buildup over time. This is easily solved by using vinegar inside of the unit to de-mineralize it. You’ve probably done the same thing for your coffee maker. This is no different. Don’t sweat the quality of your water supply too much.